With his statement on Thursday, Ulukaya announced that he is going to join the Giving Pledge, the funding system the riches donate half or their wealth, by building a new foundation called Tent. “I have always planned to give most of what I had. Growing up, I watched my mother give to those who needed and it came from the most amazing place in her heart,” Ulukaya said. 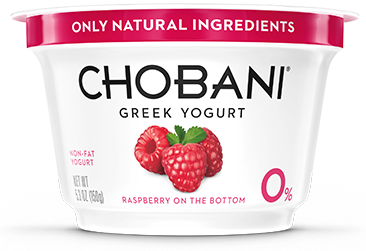 One of the biggest American companies Chobani, founded in 2005, started making Greek-style yogurt in 2007, in Upstate New York. Within his family’s farming background, Ulukaya used his experiences to create a great opportunity to build Chobani. Ulukaya said what brought him to the USA was to learn English, but seeing the great opportunities in the USA made him stay here after school. 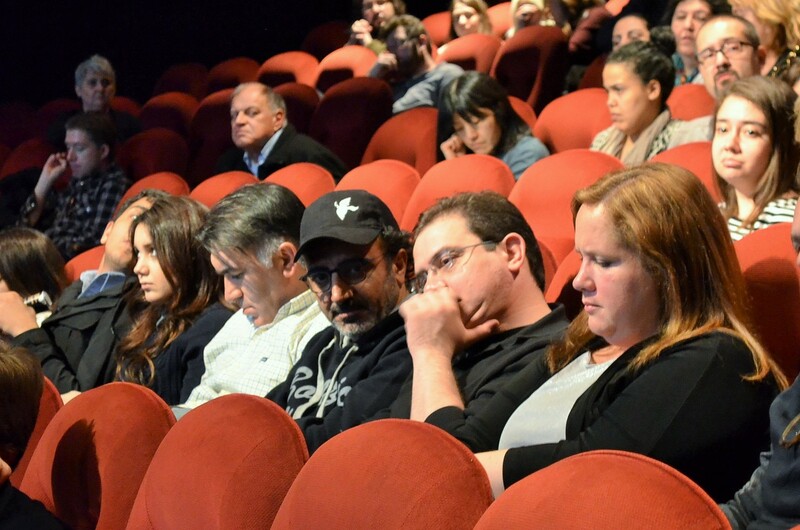 “In 1994, I came to New York to study English and later became drawn to the idea that anyone can start something in America—all you needed was a dream and the willingness to take a risk,” Ulukaya said. Chobani was a small factory located in Upstate New York and then lead Ulukaya to be one of the richest people in America. According to the Bloomberg Billionaires List of 2014, Ulukaya’s personal wealth is over 1.4 billion dollars. 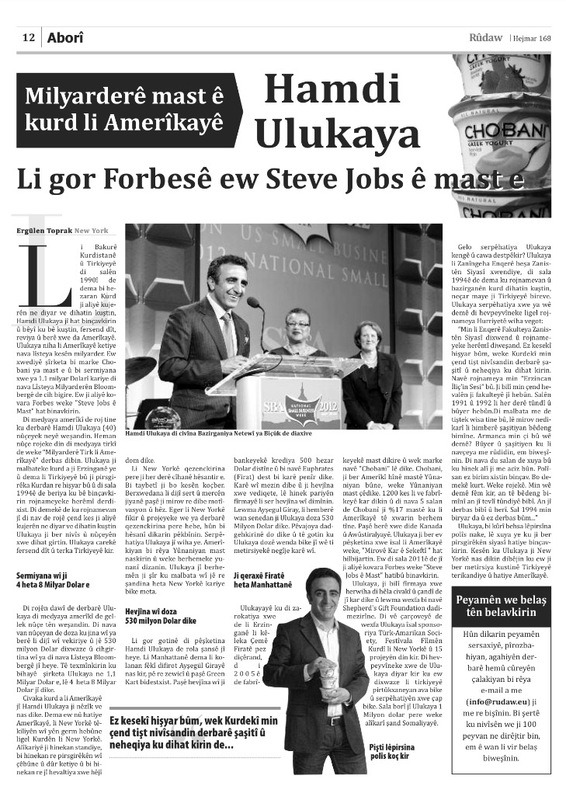 In 2014, Ulukaya was invited to the White House and called a member of the Presidential Ambassadors for Global Entrepreneurship (PAGE). Remembering his real story is what encourages him to get involved with a new donation organization, Ulukaya says. Knowing his own people who are being attacked by the ISIS, in the city of Kobani located in northern Syria, and Iraq, in need of everything after they had to flee from their home, Shepherd’s Gift Foundation of Chobani donated 2 million dollars for them through United Nation, UNHCR, in 2014. After building the Tent, Ulukaya is willing to donate half his wealth, over 700 million dollars to buıld a new charity organization for the refugees in Kurdistan as well as all around the world. This article was first published at the below link and shared on the social media over 550K. Previous Post Helly Luv savaş meydanında klip çekti: Korkma, birleş, bu bir devrim! Thank you for being the person you are. My Mexican grandmother and mother were and are also givers. From now on, I will make sure to purchase your yogurt. I am trying to find out a reputable organization that I can donate to to support the refugees? Any suggestions? What a great donation! Save the refugees and the commercial fisherman. Buy some Bristol Bay wild salmon to help feed the world. Wild fishermen in some ways get displaced when they can’t make a living off it anymore. Once that happens other non renewable resource development sometimes move in and degrade water quality and destroy intact ecosystems. Wish we can all help each other out. God bless the refugees and thanks Sir for your generosity. There are some great suggestions in this article, Rosa! God bless you! You make the world better! Thank you! I am so impressed. I have never eaten Choban…though I see it on the shelf. In honor of his action, I plan to try it. I hope these refugees will be given land to start their own farms. absolutely..the best news I have heard in a long time…I am so grateful to have a man stand up and do something..that a whole country hasn’t even tried to do..God Bless you and the people , whose souls will be given a new start at life…I am in tears..
Chobani is good yogurt, and this is such a good man. Wonderful history of his life, and a beautiful spirit to be so giving. May his company continue to grow so he can continue to support this very worthy cause. God bless this man as he is an inspiration to all that share great wealth & fortune. I am very pleased this post came to my FB page. Chobani is my favorite yogurt, as well as my Granddaughter’s Maliyah’s favorite yogurt! I had no knowledge of the Company’s origin nor native Kurdish roots! Truly amazing taste and quality of yogurt flavors! We would love to have Mr. Ulukaya & Chobani Yogurt & Foods, as our Premier Sponsor, in our efforts to raise the Spiritual, educational, and social Consciousness of American youth! Specifically this of African-American Ancestry, and others who suffer from the hardships of repression, hopelessness, and racial & economic discrimination! We are a Registered Oregon Domestic Charity benefiting High School and College Youth Internships and STEM, Arts, Sports, and Life Science Scholarships. Please contact me and let us know of your interest in partnering with us. I will be happy to share additional information with you! You may reach me, directly, at (503) 910-1139 or via email address above. Salem, Oregon; Las Vegas Nevada. Our current Client is Mr. Les ‘Pee Wee’ Harrison, world renowned Player with the Harlem Globe Trotters and Three Guys and A Ball, and A.P.P.L.A.U.S.E., Character Enrichment and Anti-bullying and Violence School Assembly Outreach Programs! Wow, the man literally gives away half his fortune to help the distressed people of the world and YOU HIT HIM UP FOR MORE MONEY!!! BIG TIME CLASS MOVE THERE!!!! You are a great example to everyone …. love how you gave 10% off the top (tithing) … and then so much of the overall profit …. Biblical principals that demonstrate … you can’t outgive God. He has blessed you richly! THIS is what a SUPER HERO looks like! THIS is what SUPER HEROES DO! Let’s see how many so-called “celebrities” will follow his lead. I thank you for all your help to those who are helpless. I wish I could do as you have done. All l can do is pray and hope that everyone can have the blessings I have received by my immigrant parents. I was just praying about the needs of your Kurdish people. The images I have seen are heartbreaking. Then I saw this message of FB and I wanted to cry for joy. Thank God for your kind and giving heart. Switzerland , Austria and Germany open their borders to take in the refugees while certain people make their own plans in the U.S. to build a 1,200 mile wall on her border to keep others out. Kind of makes you ashamed, doesn’t it? God will bless you for your humanity. There’s a difference between economic migration and refugees due to war and famine. Countries have to protect their borders and manage for economic migration. In time of extreme disaster, bringing in refugees is a given. By the way, the U.S.has contributed billions towards refugee resettlement. “Building the wall” is a a reflection of some people’s frustration of U.S. government not better controlling the economic illegal migration into the U.S.
More accurately it’s a reflection of some people’s misplaced frustration. If the jobs weren’t there the illegal immigrants wouldn’t be coming to the U.S. to provide for their families. If you’d like less government, you should be angry at the business owners who are cheaply paying less than minimum wage to illegal employees. Go back and read your first sentence. Those countries opened borders that they had in place to a specific group of people who are refugees. Its a lot different than what we’ve got happening on our southern border. I am so happy for you and all the people you are helping. It is a Blessing for both you and them. I have been eating Chobani fat free yogurt for years. It’s the best tasting and best quality . Please continue making it just the way you do. Don’t change it. Cho bani Yogurt is perfect, it does not need improvement. May God Bless you and Keep you. May God turn His Face towards you and give you Peace. May everything you care about increase in Favor with Gid and with Man. I too, am now motivated to increase our giving to the people of conflict areas and the children of such, learn again the joy and innocence of being a child. Please help Baby Maryam for her bone marrow transplant. Please add me on FB as my friend Jessica smith asked me to frien request you. Please help us with baby Maryam a 3 year old girl from Afghanistan who has Major Thellasimia condition. The family doesn’t have the money for bone marrow transplant which will cost them $40,000 to take her to India for her to get successful bone marrow transplant. Thanks and God Bless. Please add me on FB my name is Michelle Nasiri. I only hope that your intelligence and ability to help are matched by a strong follow up insuring that your valuable contibution is going where you intend it to and is not being siphoned off into the wrong pockets! Please keep on top of this for everyones good and THANKYOU!! My ancestors came from Greece per my Aunt Rose…does that qualify me?? Sure would help!! You have a great big heart and your reward will be great I believe. Be blessed!!! Teshekerederim! The spelling may be wrong…but I hope you get my meaning. I am an upstate new yorker who lived in Turkey. I practice law for a living and work at giving as a way of life. I hope to meet you one day because I have an interest in your mission. Best of luck. Inshallah…you will succeed. 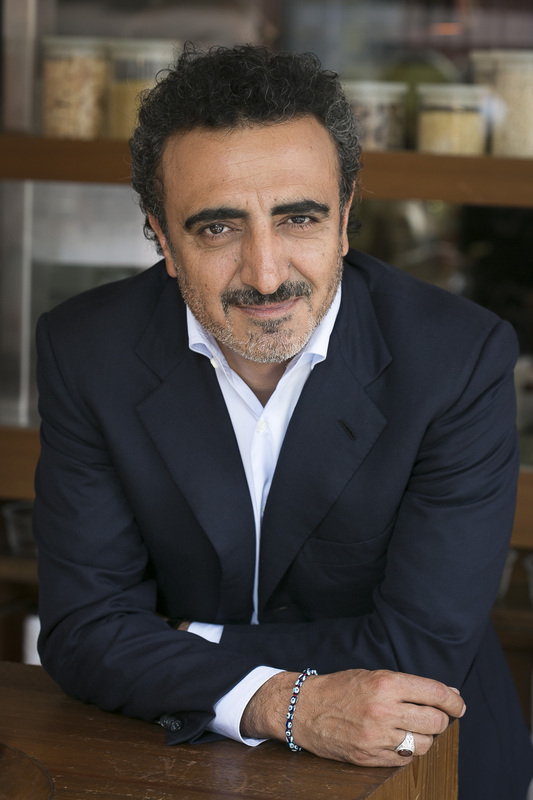 May God bless you Hamdi Ulukaya ! You are a beautiful person ! Actions speak louder than words and Mr Ulukaya, you have modelled true humanity, and shown us the true virtues of our higher selves. Your mother taught you well sir! What an incredible story of selflessness. If everyone had the same kind of caring for their fellow humans the world would be a much better place. Yes, this is a huge sum of money and he has the ability (through his hard work) to give that much but the real story is the appreciation for what he has and the knowledge that he can help someone else get closer to living a good life. It’s heartening to see people with moral consciousness who put their resources to save others. Hope Kurdish refugees have some respite in these tough times. This extraordinary gesture will give rise to more creative thinking (constraints often do) but for starters, you could set up this initiative in Detroit, just north of downtown, which is literally abandoned. There are tons of empty houses, lots and storefronts that could be revitalized. Indeed on a smaller scale, two more communities that would benefit from an influx of hard working, enterprising people are Norwalk, CT and Providence, RI. Anyone who manages this type of difficult, heart-breaking journey all the way to the U.S. has to be an extraordinary person — like each of my grandparents. ok, so he’s donating… sort of. He’s starting a new charity. I’d like to know how this charity will SPECIFICALLY help refugees. God Bless you for such an amazing and phenomenal gift and service! This is what being human is really about. Wow, this gives me chills. Thank you, Mr. Ulukaya, thank you!! An example to be followed by others!!! Reblogged this on Attempted Human Relations and Self. Pingback: For The Children: Please Join Me In Supporting Syrian Refugees | B the Change. What kind hearted spirits Bill Gates, Warren Buffet and Hamdi Ulukaya and so many other self made bizillionaire are to give so much. They’ve all given far more than just monetary funds. If each person gave one thing, whatever is within our abilities whether it be a monetary, time or a simple smile donation this world could be such amore beautiful place. A place where homelessness and hunger and, chance and hope exist. But Bristol Bay Wild Salmon and feed the world. Buy Green Mountain Coffee to ensure these coffee farmers get a livable wage, water and schooling for their children. Help them helps us all. Please, do not forget our veterans!!! Just hope someday mr.chobani goal and unmeasurable act will serve as inspiration to those people who are rich too. I need your assistance sir hope that I am one of your beneficiary im always pray to our almighty father that I can find generous person who can extend their blessings .im always hoping thank you .God Bless you and your family always..